Automatic detectors have been installed in various unmanned and other critical areas of the Refinery designed to convey alarm upon detection to the Fire Control room panel. In addition Break Glass type Manual call points are located around Process Plants for quick communication of outbreak of fire by manual operation. Actuation of the alarm conveys audiovisual indication on the Control and Repeater panel. Critical areas of the Refinery have been installed with toxic and hydrocarbon Gas detectors with local alarms with added facility to simultaneously notify Control rooms through the DCS system for early detection of hydrocarbon leaks. In addition to this we have portable intrinsically safe gas detectors carried by personnel during rounds in Units to detect gas leaks. MRPL's fire protection measures conform to Bureau of Indian Standards and Oil Industry Safety Directorate standards. Fire Protection measures have been devised to cater to the various hazards associated with different Units and its related processes. The fire protection system has been divided into fixed installations, Mobile appliances and Portable first aid fire fighting equipment. Fire extinguishers of dry chemical powder type and carbon di-oxide type of various capacities have been installed at various locations for fighting fires at its incipient stage. Dedicated maintenance crews keep the fire extinguishers in good working order. Critical Process Units have been provided with medium velocity water spray systems and deluge systems for Horton spheres and hot pumps. These systems are augmented by Fire water monitors and hydrants all around the Refinery. Floating and fixed roof hydrocarbon storage tanks have been provided with cooling system in addition to fixed foam system. Central hose stations, hose boxes and hose reels have been located as support systems. The firewater network has dedicated water storage of 40,000m3 with additional provision of 1x 1,50,000m3 and 2 x 55,000 m3 from the Raw water reservoirs. The entire fire water network of 40.05 kilometers is energized by firewater pumps which sustain a pressure of 10 kgs/cm2 by auto start facility during emergencies. Foam Tenders with one Foam Nurser as back-up and Dry Chemical Powder Tenders make up the mobile appliances. The foam tenders have rear mounted pumps driven via the Power Take-off in addition to foam tank and water tank. Each DCP Tender carries 2000 kgs. of powder with Nitrogen batteries for expelling the powder. Foam Nurser has 7500 litres foam tank and can replenish foam tenders at location with its own gear pump. Jeep and Tata mobile vehicles are used to carry out inspections. Trailor pumps to fight fires from open water source is an additional equipment available. The modern communication system includes telephones, Nuemann paging systems, intrinsically safe Wireless radio, pagers and public address system. Long range siren has been installed to alert all concerned during declaration of any emergency. We at MRPL are dedicated to the cause of Safety and endeavor to adhere to the highest standards in our Health Safety and Environment management system to prevent and minimize loss due to fires and other accidents and for the protection of the environment. Fire Orders: Duties and responsibilities during emergencies of the various Departments / Sections have been established in detail and brought out in the Fire Order'. Fire Call Rota:Designated Groups consisting of members of various disciplines are detailed on rotation to facilitate the mobilization of additional manpower during emergencies. Mutual Aid Scheme: Mutual Aid schemes have been established with nearby large Industries with the specific objective of sharing resources and manpower during the occurrence of large-scale emergencies. Periodic interaction by way of Onsite / Offsite Mock exercises between the Mutual aid members enable them to acclimatize with the potential hazards and the various fire protection measures adopted in either facility. Disaster Management Plan: MRPL has well-developed Onsite Disaster Management Plan which has the approval of the Director of Factories. Mock exercises are conducted to test the response and efficacy of the emergency and allied services including mutual aid members. Observers are appointed and observations and suggestions are implemented to further improve the system. In addition District Authorities in close association with MRPL developed Off-Site Disaster Management Plans. Mock Off-site emergency exercises are also conducted. Community(Public) Awareness Programs : Periodic public awareness programs are conducted for nearby communities and schools including our Colony residents. During the annual Safety Day function competitions are held for employees, their family members and nearby schools and prizes distributed. 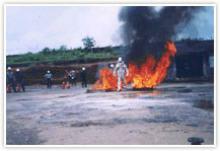 The best-equipped live fire-fighting ground is used to train all staff. Fully functional safety and housekeeping committees. Mutual aid scheme with neighbouring industries Regular mock fire drill documented on-site emergency plan.